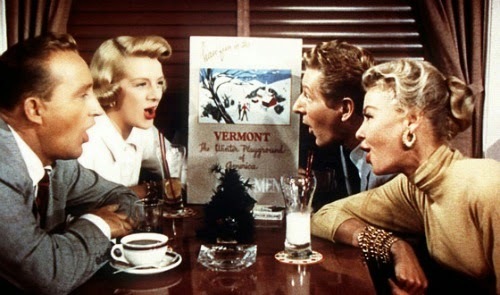 Many times I feel like a broken record (this time playing a Christmas tune), but White Christmas is one of those classics that I never get tired of. It is so ingrained, so integral to my childhood memories, that I have difficulty analyzing it or finding fault. Wonderful, visceral films stop being something that must be thought about and simply become an all out experience. That’s what White Christmas is for me. A full blown Christmas experience courtesy of Bing Crosby, Danny Kaye, Rosemary Clooney Vera-Ellen, Dean Jagger, director Michael Curtiz and of course Irving Berlin. I mean this as a compliment, but at a basic level, I always thought of White Christmas as a Christmas-like version of Singin’ in the Rain. We have a talented and dashing leading man in Crosby (Bing Crosby) and his mischievous and hilarious partner in crime (Danny Kaye). They are never better than during their parody of the sister’s act (It’s a priceless gem of a moment). Although, there is constant chemistry throughout the film thanks to the bickering and back and forth between two buddies. Similarly to Singin’ in the Rain, you also have big spectacles, lavish sets, great songs, dancing, and constant quotability. It brings out the most reluctant of crooners and even the guys with two left feet. But what about the story? White Christmas follows those two war buddies as they make it big as a boffo double act. Along the way, they help out a pair of sisters as well as their washed-up former commander General Waverly (Dean Jagger), who owns an inn in snow-less Vermont. Although, it’s lacking in business, it’s the perfect locale for matchmaking, acts of kindness, and misunderstandings courtesy of local innkeeper and resident eavesdropper Emma (Mary Wickes). But what we end up receiving is a joyous romance with plenty of Christmas cheer and sentiment to go around. 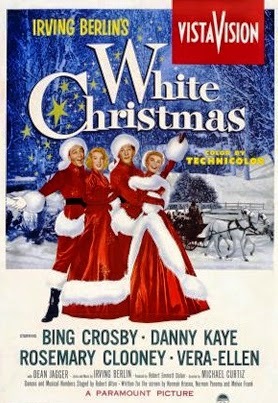 Bing Crosby’s pipes are as good as ever (“Count Your Blessings”) and Danny Kaye can make his voice crack like no other. Vera-Ella has a talented pair of legs and Rosemary Clooney can carry a tune in her own right opposite Crosby. Whether it’s “Snow,” “Sisters,” or the eponymous track, there’s so much to offer. Weather any slow sections and you will be rewarded thanks to the even-handed direction of Michael Curtiz (Casablanca), paired with the ever memorable compositions of Irving Berlin. Now go spend the holidays with your kith and kin. Vermont must be nice this time of year, all that snow. This entry was posted in 1950s, Comedy, Holiday, Musical, Romance and tagged Bing Crosby, Danny Kaye, Dean Jagger, Great Film, Irving Berlin, Marry Wickes, Michael Curtiz, Review, Rosemary Clooney, Vera-Ellen by 4StarFilmFan. Bookmark the permalink.